Are you missing something? I believe a contact us widget is missing from your blogger blog. 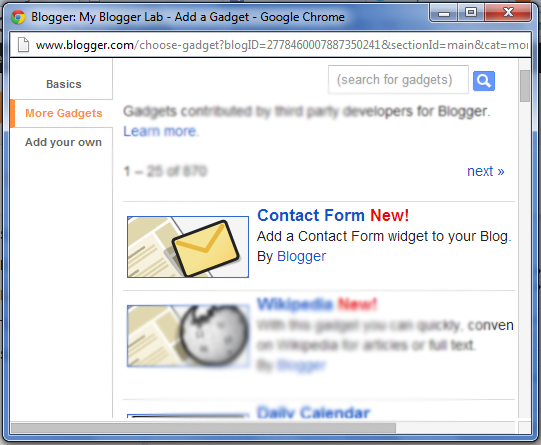 After the consecutive improvements in Blogger HTML editor and Google+ Comments for Blogger, previously we heard some rumors that Google is about to release its brand new Contact us widget that can be added in the sidebar of any blog that is hosted at blogger. Today Google officially made an announcement that the Contact us Widget is ready can be applied on those blogs which are hosted at blogger. The first thing you need to do is to login into your blogger dashboard. 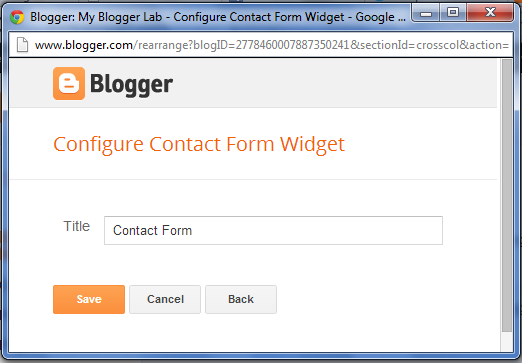 Now go to Your Blog >> Layout >> Add a gadget >> More >> Contact Form widget. Check out the following screenshot for a detailed guide. Once done, move to the next step. Now rename the title of the widget and once everything is done press “Save” button located at the bottom of the window. Congratulations: The built-in Contact us Widget is added to your site. Visit your site and confirm that the widget is successfully integrated in your sidebar. The features of this widget are somewhat like an ordinary contact us form, or in other words you can say that it is pretty much like simplicity at its best. It has three files one for the email address, the second for the name and the third is finally for the message. The good thing is that this widget supports Email validation. Which means, when someone would enter an invalid email address it would display an error message such what similar to the following screenshot (A valid email address is required). This widget does not support Captcha codes, which means that you would receive spammy emails if someone attacked your gadget through a robot or any other software. There are still few bugs in the gadget, but comprehensively it is indeed a much needed improvement. Now most of the folks can easily add a contact us form without even hosting it on a host. However, if you mean real business, then this contact us page might not help you greatly. that is great update, but it does need some modification, it would be great if it was applicable in contact page. any way nevertheless thats good for bloggers. why dont u show a preview first? Well This widget is not coded by our developers and Its pretty much simple like a normal contact us page. These gadgets often gets redesign so providing a design and changing it again it a laborious task. Adjustments to the font color and a larger font for the title would be incredible.